Summertime is also garage sale time for me and I make sure to get around to a lot of them. Early in the season, the town in which I live has a town-wide garage sale day when somewhere around 500 families participate. I think the best I have done over the years is manage to visit about 300 of them over the Friday, Saturday, and Sunday when they are happening. I rotate where I start and finish and on which day I visit which section first from year to year. The town puts out a map the week of the event and that makes it easy to keep track of where you have been and to plan some efficient routes so as to maximize your efforts. Sound like a nerdy-gamer approach to garage sale weekend? It is indeed! This year was a bit less fruitful than others, though I did manage to pick up a Cedar Key PVC Rain Suit for next to nothing, as well as some topnotch winter boots from a guy who had to close his store but hung on to the stock to unload at a few garage sales over the summer months. Bad break for him but he still got some ready cash and the Chicago winters and early spring weather will have nothing on me. I did manage to score a couple of gamer items for rock bottom prices, too. As per my usual, I picked up a few ceramic houses and buildings to use as scenery, and nothing for more than a buck. Also, I grabbed a few used and possibly incomplete games of Othello, Scrabble, and Yahtzee, each for a quarter of fifty cents each. The pieces make great ready bases for individual miniature figures, rank and file guys who aren't going to get anything fancy done with them. These sorts of things are best grabbed on Sunday when people have realized that they aren't going to sell anyway and you can offer a bit of change to take it off their hands. Honestly, an incomplete game like that isn't going to do anything but collect dust on a shelf and remind someone year after year that they could have sold it for a quarter. It doesn't hurt to remind someone that anything they take back inside is something that could have been sold and that they didn't want anymore anyway. You can get complete versions of any one of those common games at a Salvation Army or thrift store for a buck. One of the best deals was two rolls of Maysville Carpet Warp, 800 yards each, for a dime a piece. One is dull yellow and the other dull orange. If I could have gotten it in brown or linen or white I would have grabbed it but just the two colors were available. With a bit of coloring, both will be useful as rope for 28mm figs, rigging if I get one of the boat projects lanuched before I use it up (which is unlikely cause it's 800 friggin' riggin' yeards!). 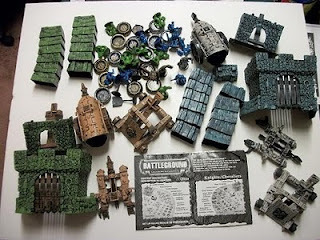 A couple of the gamer gems I did happen to grab, each one for a mere three bucks, are an unboxed, almost complete, game of Battleground Crossbows and Catapults. 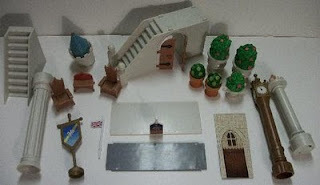 Even incomplete, this lot has useful items for miniature gaming and/or RPGing. 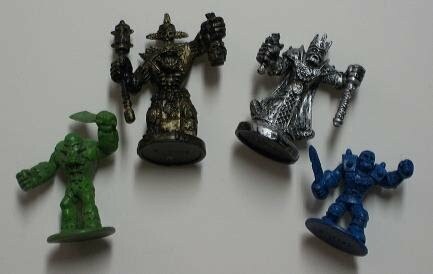 The figures alone could represent a couple of factions of thugs, one human and one orc, plus their leaders, and at 28mm scale. The catapults will be immediately useful for my Medieval Fantasy Combat Miniatures Games and the gates can certainly be worked into some set pieces for the same. Three bucks was a bargain for me. 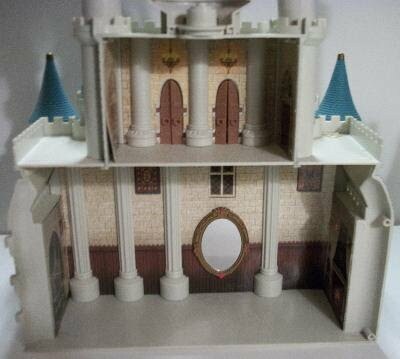 So, too, was the Disney Cinderella Castle Playset I snagged a bargain. It wasn't in great shape and though I see it goes online for one hundred bucks or more, mintish, I figure giving up the figs and just grabbing the castle and accoutrements for three dollars was worth the effort. It would have also been an incomplete set anyway, with some parts missing, so negotiating away some of the characters that the original owner could make a few extra quarters selling, helped bring the price down a bit more. I have never battled an opponent who would have been impressed by an army lead by a pumpkin carriage. 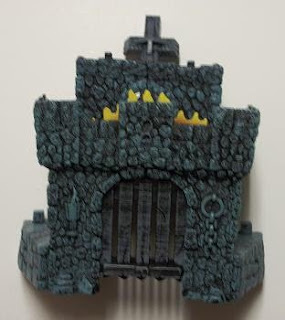 I also figure it's going to take some serious kit bashing to make this into something I can put on a game table without getting too much guff. Can anyone say, "Start by priming it black?" Anyway, there we are for the early portion of this season's garage sale purchasing. There will be more as the summer and early autumn roll onward. It's already been a good year so it can only get better. Larger versions of the images and others related and not related to this article are always available in the Picasa section of my site. 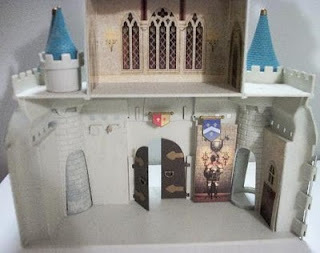 Nice job with the C&C set and the castle! 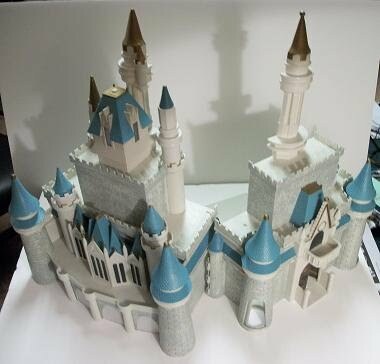 Put them together and you could have a pretty fun evening game of a siege on Cinderella's fortress! Yeah, that C&C set looks like quite a score! 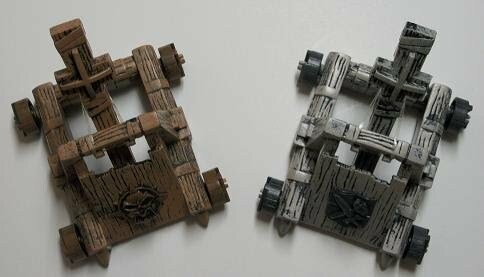 I remember getting the first vesrion of Crossbows & Cattapults which had what appears to be the same stackable blocks and similar catapults. That set had barbarians and vikings. Years later the "Weapons & Warriors" sets copied the basic idea but the weapons shoot little red balls, and the figures are more historical. I snagged a number of sets from Kay Bee toys when they were on clearance. I saw this newest version of C&C at Target or something a few years ago and it looked nice.